Interferon-free regimens containing sofosbuvir (Sovaldi) plus simeprevir (Olysio) cured about three-quarters of people with genotype 1 chronic hepatitis C with advanced cirrhosis and MELD scores >10 in the real-world HCV-TARGET study, researchers reported at the European Association for the Study of the Liver (EASL) 50th International Liver Congress last month in Vienna, Austria. The sustained response rate in HCV-TARGET fell to 39% for genotype 3, but another study found that 70% of people with genotype 3 with decompensated cirrhosis could be cured with sofosbuvir plus daclatasvir (Daklinza), while sofosbuvir/ledipasvir (Harvoni) cured up to 86% of people with genotype 1. Interferon-free regimens of direct-acting antiviral agents (DAAs) can now cure most people of chronic hepatitis C, including those traditionally considered difficult to treat. But challenges remain when treating people with the most advanced liver disease – a population that has trouble tolerating and responds poorly to interferon-based therapy. Rajender Reddy of the University of Pennsylvania and colleagues analysed outcomes among people with decompensated cirrhosis in HCV-TARGET, an observational study by a consortium of 39 academic and 13 community medical centres in the US, Canada, Germany and Israel. The study enrolled more than 2200 people from December 2013 through to October 2014. The researchers looked at people treated with all-oral regimens including sofosbuvir with ribavirin alone, and sofosbuvir plus simeprevir with or without ribavirin. As this was an observational study, treatment was selected by participating clinicians according to local standards of care, not randomly assigned. This analysis included 253 participants with cirrhosis and a MELD score >10 who had not undergone liver transplantation. MELD score is an indicator of liver disease severity calculated using bilirubin and creatinine levels and blood clotting capacity (INR). It is used to predict how urgently a patient needs a liver transplant. Scores of 10-19 predicted three-month mortality of 6%, rising to 20% with a score of 20-29, more than 50% with a score of 30-39 and more than 70% with a score above 40. Just over two-thirds of study participants were men, most were white and the mean age was 59 years. Around 75% had HCV genotype 1, with the remainder about evenly divided between genotypes 2 and 3. Nearly 60% were non-responders to prior treatment, including 15% who failed prior triple therapy with boceprevir (Victrelis) or telaprevir (Incivo or Incivek). More than 80% had MELD scores of 10-15, but 11% had scores of 16-21 and 4% had scores >21. The mean albumin level was 3.3 g/dl, mean bilirubin was 2.1 mg/dl, mean creatinine was 0.9 mg/dl, platelet count was 84,000 and INR was 1.4. Three-quarters had a history of decompensation (when the liver can no longer carry out its vital functions) and 17% had liver cancer. Patients were treated with either sofosbuvir and ribavirin (n = 76), sofosbuvir plus simeprevir (n = 108), or sofosbuvir plus simeprevir with ribavirin (n = 32). As simeprevir is primarily effective against HCV genotype 1, almost all patients with genotypes 2 or 3 received sofosbuvir with ribavirin alone. Most were treated for 12 weeks, though a few were treated for 24 weeks. The researchers looked at an efficacy cohort of 216 people who completed therapy and had adequate follow-up to determine sustained virological response, or undetectable HCV viral load, at 12 weeks post-treatment (SVR12). Looking first at the genotype 1 group, the overall SVR12 rates were 52% for sofosbuvir and ribavirin alone, 74% for sofosbuvir plus simeprevir, and 66% for sofosbuvir plus simeprevir with ribavirin. Cure rates did not differ much between treatment-naive (43%, 78% and 60%, respectively) and treatment-experienced (57%, 72% and 68%) genotype 1 patients. Only half of patients with HCV subtypes 1a or 1b were cured with sofosbuvir and ribavirin alone, but sofosbuvir/simeprevir seemed to work somewhat better against subtype 1b than 1a (87% vs 66%). Adding ribavirin to sofosbuvir/simeprevir "did not seem to have major impact" for either subtype, Reddy said. People with HCV genotype 2 did well using sofosbuvir with ribavirin alone: 81% achieved SVR12. But people with HCV genotype 3 had the lowest sustained response rate, with just 39% being cured while 46% relapsed. Higher MELD scores did not appear to have a negative effect on response rates – in fact, all seven patients with scores >21 achieved SVR12 using sofosbuvir/simeprevir with or without ribavirin. Among the genotype 1 group, higher albumin and lower bilirubin levels were the only independent predictors of sustained response; subtype 1a vs 1b did not quite reach statistical significance. A majority of patients experienced an improvement in liver function status after treatment, especially those with sustained response. Among 64 people with baseline MELD scores of 10-15 and available post-treatment data, 55% saw a decrease in their score, 25% had no change and 20% saw an increase. Treatment was generally safe. Adverse events were common given the patients' advanced state of disease, but most were classified as mild. There were 16 cases of liver decompensation, 10 serious infections and three deaths; 12 people received liver transplants during treatment. The most frequently reported adverse events were fatigue (36%), anaemia (18%), nausea (17%), infections (14%) and flu-like symptoms (12%). Not surprisingly, anaemia was more common among people who took ribavirin. "All-oral DAA therapy has been readily used to treat HCV cirrhosis with MELD score >10," the researchers concluded. "MELD score and serum albumin improved or remained stable in the majority of patients," they added. "Long-term follow-up is needed to assess the impact of SVR on the reversibility of the severity of liver disease." Commenting on the selection of regimens, Reddy noted that "these are very sick patients, and physicians wanted to use what was out there." However, sofosbuvir plus simeprevir is no longer as widely used for genotype 1 patients since the debut of Gilead's Harvoni sofosbuvir/ledipasvir coformulation and AbbVie's paritaprevir/ombitasvir/dasabuvir '3D' regimen (Viekirax/Exviera or Viekira Pak), as the cross-company combination has a much higher cost. Sofosbuvir plus ribavirin remains an effective standard of care for genotype 2, but better treatment options are still needed for people with genotype 3. In a related real-world study presented at the same session, Graham Foster from Queen Mary's University of London and colleagues looked at 467 hepatitis C patients with decompensated cirrhosis treated through the English expanded access programme. More than 70% were men, most were white, the mean age was 56 years and 6% were HIV-positive. About half had HCV genotype 1, 41% had genotype 3 and the rest had other genotypes; 47% were treatment-experienced and 10% had received liver transplants. These patients had MELD scores ranging from 6 to 36 (mean of about 12). Child-Pugh scores – another measure of liver disease severity – were >7, including 66% with CP class B and 10% with class C (the most severe). More than 90% had past or present liver decompensation and many had ascites, bleeding varicose veins or encephalopathy. Others had non-hepatic manifestations deemed likely to lead to irreversible damage within a year or were judged by a review panel to have other exceptional circumstances. Participants were treated for 12 weeks with sofosbuvir plus an HCV NS5A inhibitor – either ledipasvir or Bristol Myers-Squibb's daclatasvir. Again, this was an observational (not randomised) study and clinicians selected the regimens. Among people with genotype 1, 35% used sofosbuvir/ledipasvir with ribavirin, 10% used sofosbuvir/daclatasvir with ribavirin and 6% used one of these combinations without ribavirin. Among people with genotype 3, the corresponding proportions were 13%, 24% and 3% – reflecting the greater expected effectiveness of daclatasvir against this genotype. Looking at the people with genotype 1, SVR12 rates were 86% for sofosbuvir/ledipasvir with ribavirin, 81% for sofosbuvir/ledipasvir alone and 82% for sofosbuvir/daclatasvir with ribavirin, falling to 60% for sofosbuvir/daclatasvir alone. Among the people with genotype 3, the sustained response rates were 59%, 43%, 70% and 71%, respectively. SVR12 rates were high across the board (85-100%) for the 43 people with other genotypes. In other words, sofosbuvir/ledipasvir with or without ribavirin, and sofosbuvir/daclatasvir with ribavirin, did not work as well against genotype 3 as they did against genotype 1. However, sofosbuvir/daclatasvir alone worked better – and in fact worked as well as this combination with ribavirin added. A substantial proportion of people experienced an improvement in liver function after treatment, including all transplant recipients. Forty two per cent saw their MELD score decrease by at least two points, while 11% saw a similar increase and the rest had no significant change. Treatment was generally safe and well-tolerated. One-quarter of participants experienced serious adverse events (mostly related to liver disease or HCV therapy), 14 people died and 16 had liver transplants during treatment. One-third of people taking ribavirin developed anaemia. While only 9% discontinued their DAAs prematurely, 6% stopped ribavirin and 20% reduced their ribavirin dose. In a risk-benefit analysis, the researchers calculated how many people were harmed during the study (either experiencing a serious adverse event or MELD worsening by two points) and how many were helped (MELD improving by two points). They found that people younger than 65 years with an albumin level <3.5 g/dl were twice as likely to be helped as harmed (28% vs 14%). But older people and those with lower albumin levels were more likely to be harmed than helped (about 33% vs 15%). "In decompensated cirrhosis, sofosbuvir and ledipasvir [or] daclatasvir are virologically effective [against] genotype 1 and genotype 3," the researchers concluded. "Over 40% of patients show improvement in liver function." While not matching the very high cure rates achieved by people with less severe liver disease, the DAA regimens used in these studies far exceed the sustained response rates of interferon-based therapy and appear much safer for people with decompensated cirrhosis. In other related research presented at the Liver Congress, the ALLY-1 study found that sofosbuvir, daclatasvir and ribavirin for 12 weeks cured 83% of people with advanced cirrhosis (MELD scores of 8-40) and 94% of liver transplant recipients, with similar efficacy for genotypes 1 and 3. The C-SALT trial showed that a 12-week course of Merck's investigational grazoprevir/elbasvir combination cured 90% of people with advanced cirrhosis (CP class B). The BOSON trial showed that 12 weeks of sofosbuvir, ribavirin and pegylated interferon cured 93% of people with genotype 3 – one-third of whom had compensated cirrhosis – but interferon-containing regimens are risky for people with more advanced liver disease. New EASL guidelines released at the conference recommend sofosbuvir/ledipasvir with or without ribavirin for people with decompensated cirrhosis who have HCV genotypes 1, 4, 5 or 6; sofosbuvir with ribavirin alone for those with genotypes 2 or 3; and sofosbuvir/daclatasvir with or without ribavirin for all genotypes. Guidelines from the American Association for the Study of the Liver (AASLD) recommend sofosbuvir/ledipasvir with or without ribavirin for genotypes 1 or 4, and sofosbuvir with ribavirin alone for genotypes 2 or 3; daclatasvir is not yet approved in the US. The optimal treatment for people with very advanced liver disease remains unclear, however. While curing hepatitis C remains a primary goal, effective treatment could potentially reduce a patient's MELD and Child-Pugh scores enough to lower their priority on the liver transplant waiting list – but not enough so that they no longer need one. Reddy R et al. All oral HCV therapy is safe and effective in patients with decompensated cirrhosis: report from HCV-TARGET. 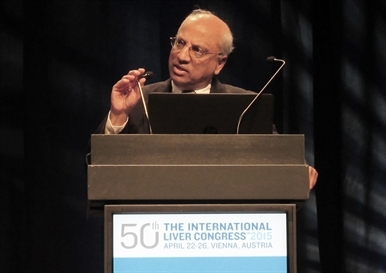 EASL 50th International Liver Congress, Vienna, abstract O007, 2015.
. EASL 50th International Liver Congress, Vienna, abstract O002, 2015.